Co-host Michelle Jokisch Polo speaks with Meredith Fennema, the woman behind "The Shop For Good". 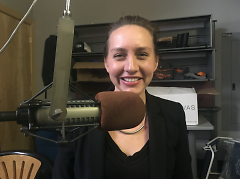 Catalyst Radio is the weekly public affairs radio program of Community Media Center, with co-hosts Katie Gordon, Jessica Gladden, Michelle Jokisch Polo, and Leah Schumaker. The program is a feature of WYCE and The Rapidian and includes interviews with organizations and people working on social change and community support, examines media and free speech issues, and takes a look at the behind-the-scenes of Rapidian reporting. You can catch it on air at noon every Friday on WYCE 88.1 FM or streaming on the Grand Rapids Community Media Center website. In this interview we learn how one Grand Rapidian, Meredith Fennema, is creating an electronic platform to help customers who are interested in using their economic power to invest in businesses for social and environmental good. "The Shop For Good" is a business directory aimed at providing the user with options to purchase from businesses that are owned by women, African Americans, Hispanic Americans, veterans, Asian-Pacific Americans, and Native Americans. Additionally, it includes companies that are green-certified. The site has over 30,000 businesses listed from the Midwest, and adding to the list every day. Fennema gathers the data from government, federal, and local government agencies, and invites business owners to submit their business if these are not found in the site's listings. As a woman entrepreneur and self-starter, Fennema is using "The Shop For Good" to create tangible ways for others to be allies to marginalized communities. The platform provides the user with their own personalized action plan to help them better direct their economic power towards business owners who face greater barriers to sustaining their businesses, and in this way help create a more equitable economy for all. To get connected to "The Shop For Good" visit www.theshopforgood.com.